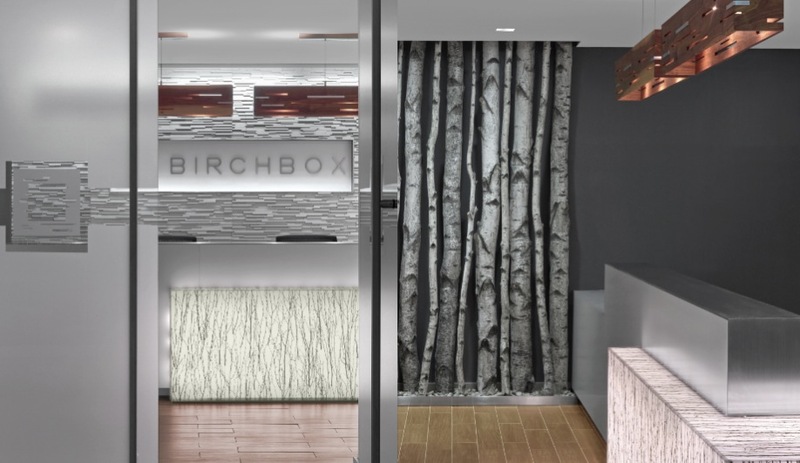 “Birch” is derived from the Indo-European for “bright, white and shiny” – words that might just as easily define the newly revamped interiors of Birchbox, a website that retails beauty and grooming products. 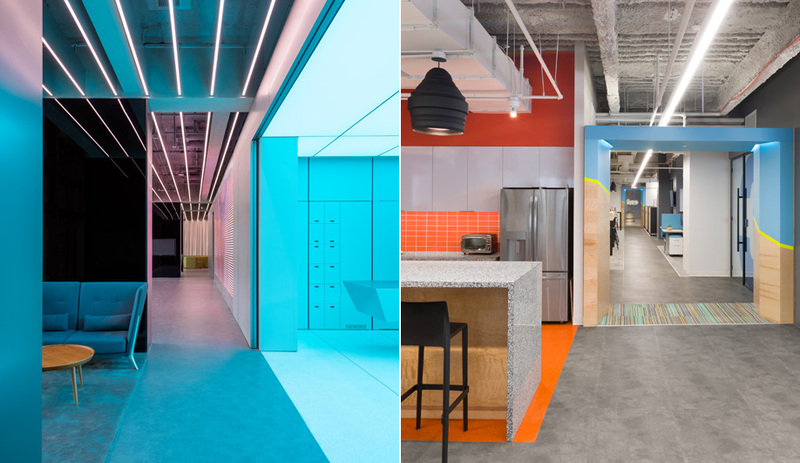 Located on the 12th floor of a tower just off Manhattan’s Madison Square Park, the three-year-old headquarters has been revamped with the help of interiors firm Design 3. Working with a palette of muted greys, warm woods and pops of pink and blue, the New York firm endeavoured to create a physical interpretation of the brand’s energetic online presence. 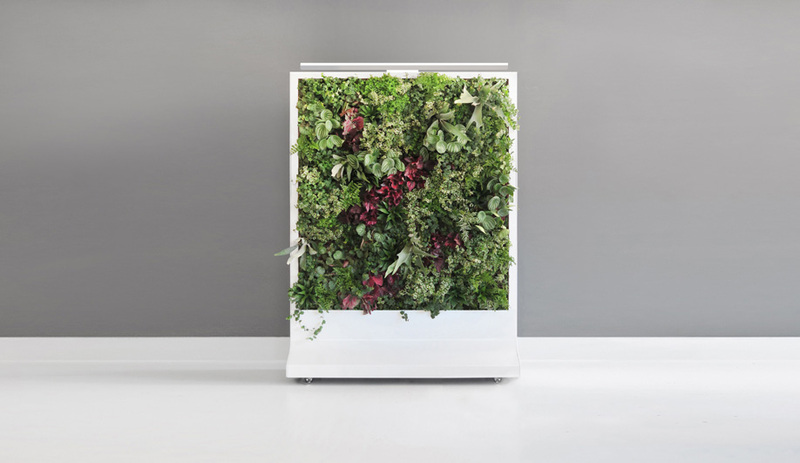 “For the reception area, we wanted a product that would mimic the organic nature of Birchbox’s logo,“ explains Design 3 principal Manny Enriquez. So they crafted a desk in illuminated acrylic with a reed pattern, and planted a row of white birch trunks in a bed of stones nearby. Architectural Systems’ Fusion wood wall panels clad the walls, complemented by porcelain floor tiles that evoke timber planks. 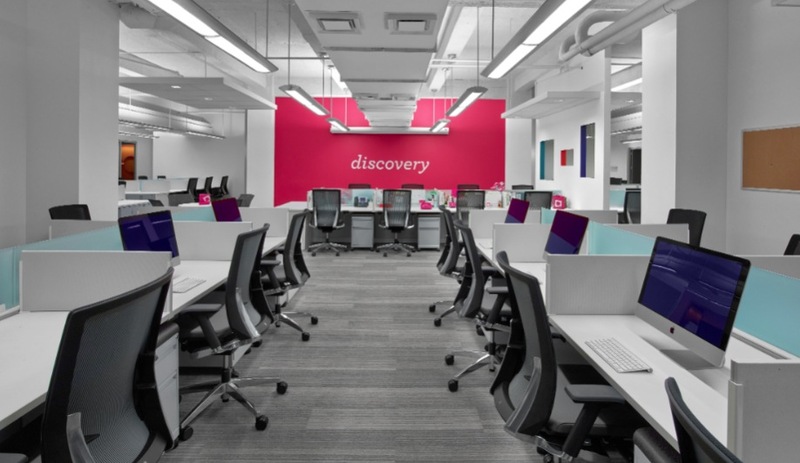 In the main workspace, a fuchsia wall emblazoned with the word “discovery” acts as the focal point, while a turquoise-painted wall adjacent displays Birchbox’s logo in the same pink hue. 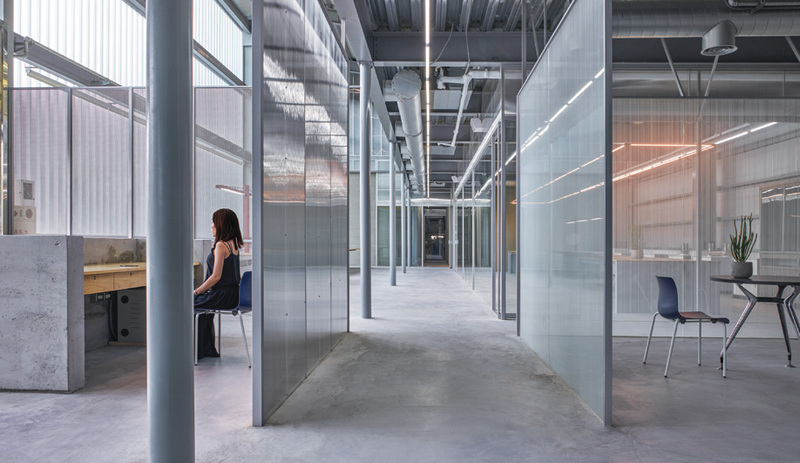 Carving up the space, pale grey walls are punctuated with square and rectangular apertures that look onto other departments. 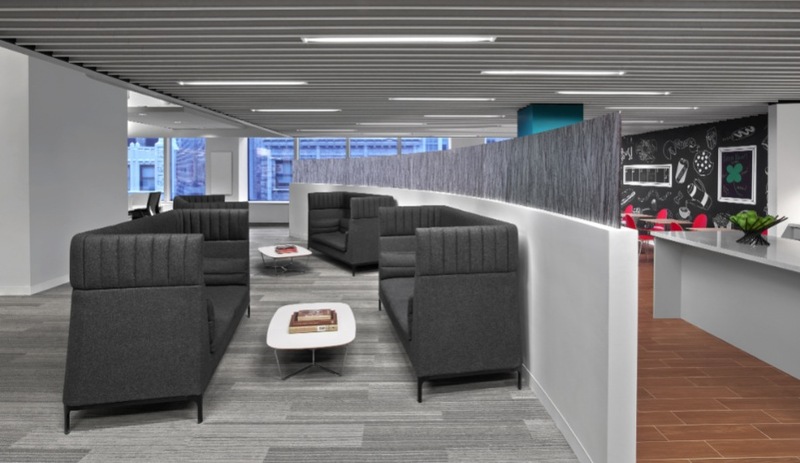 The floor is covered in Interface’s Walk the Plank carpet tiles, with their faux woodgrains, while Peerless’s sleek pendants illuminate the workstations. In a breakout zone next to the main office, high-backed chairs by U.K. brand Allermuir provide semi-private seating. 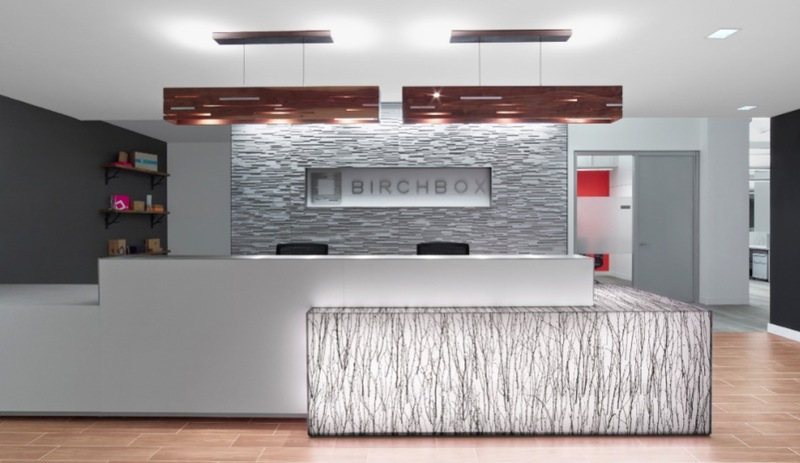 The charcoal grey sofas sit against a half-wall topped with translucent acrylic that echoes the branch motif on the reception desk. 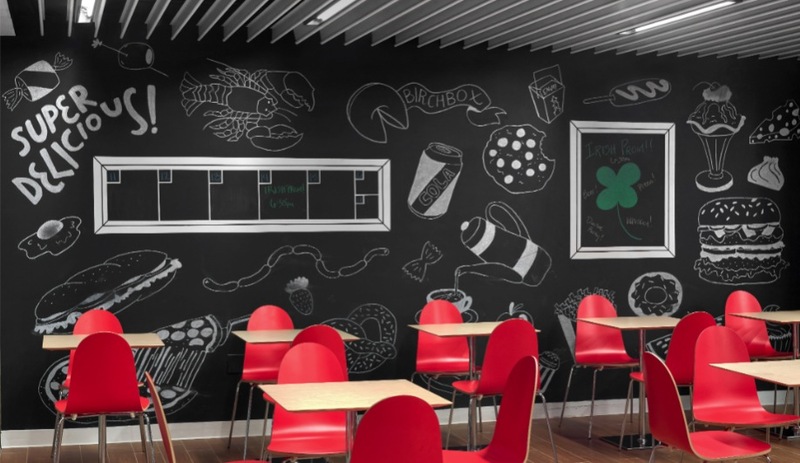 In the lunch room, light wood tables and red chairs evoke a playful cafeteria vibe, amplified by the chalkboard-painted wall with graphic illustrations of food. 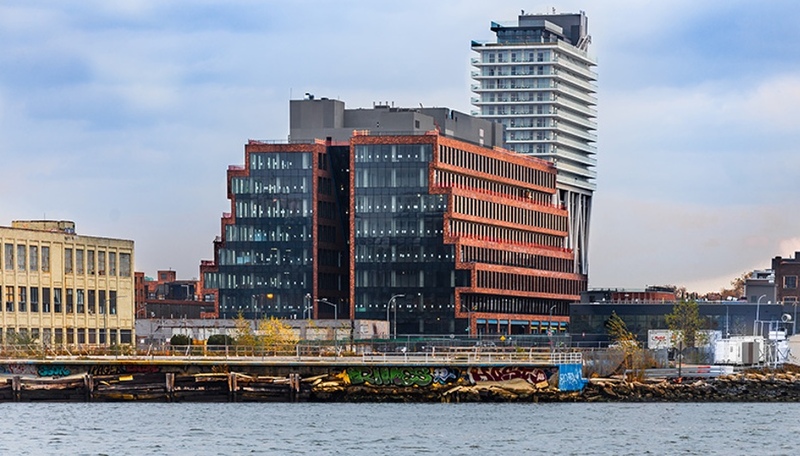 In case its office wasn’t already a fun place to work, Birchbox also built in a fitness room, with a bright tangerine wall where hula hoops and stretching bands hang. And employees can catch their breath on plush grey sofas with orange throw cushions. 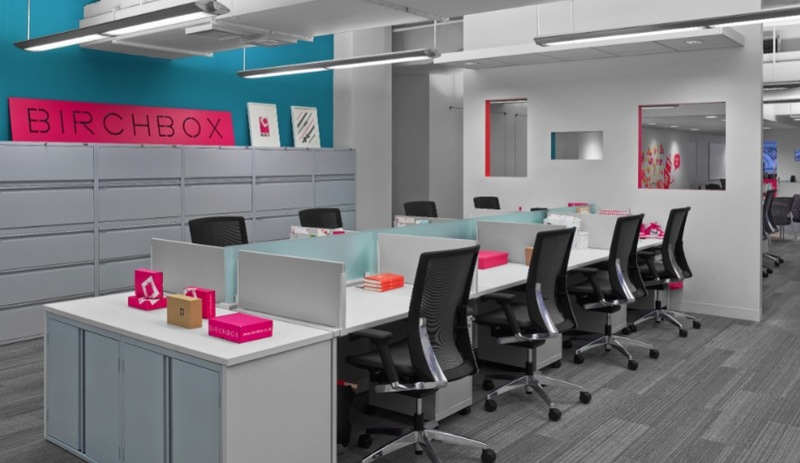 It’s a great example of how the office strives to bring employees a work-play balance, through a design with a soothing natural palette, and hits of bright colour.